In my role as the performance analyst for the Digital Marketplace I often need to show the locations of suppliers and buyers. In this post, I want to share some free tools that I use to convert postcode data into useful maps. 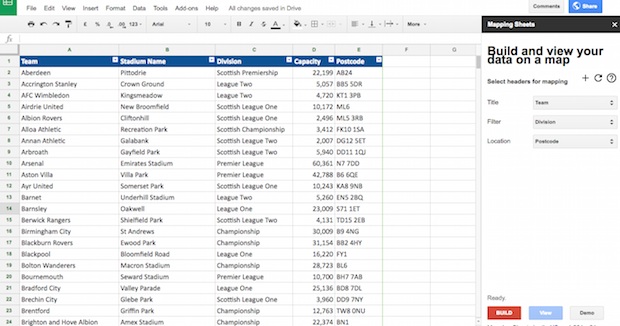 My example shows sample data of football stadiums in Great Britain. 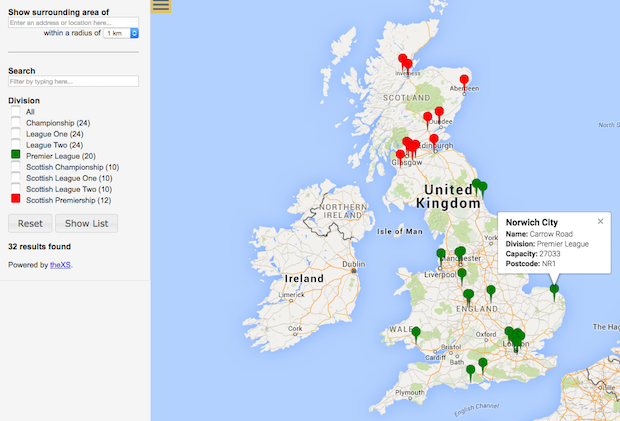 This Google Sheets add-on allows me to plot postcodes onto a Google Map. When I put the data into a Google Sheet and select the relevant columns, I can create a map with pins to show the locations of the football stadiums. The ability to filter the data and click on pins to open up more information is a useful feature. I used Mapsdata when I want to show concentrations of locations and have less than 1,000 postcodes. The data needs to be uploaded as an Excel spreadsheet. This is an example of the clustering feature. The marks show how many stadiums there are in the area. Controls on the left allow the geographical distances to be adjusted. 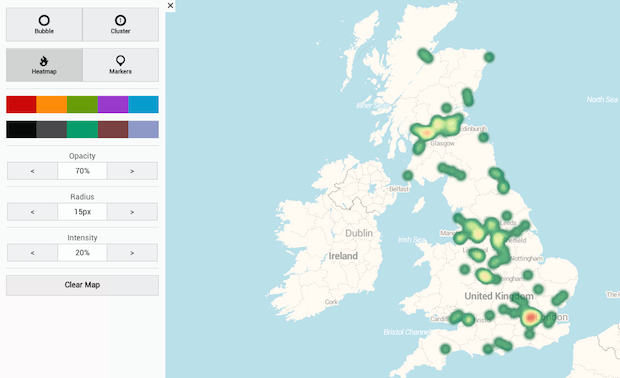 When I have large numbers of postcodes I found the Mapsdata heatmapping feature really useful. This shows the same data as a heatmap. Mapsdata also had a feature that allows me to show bubbles based on a particular column’s values. 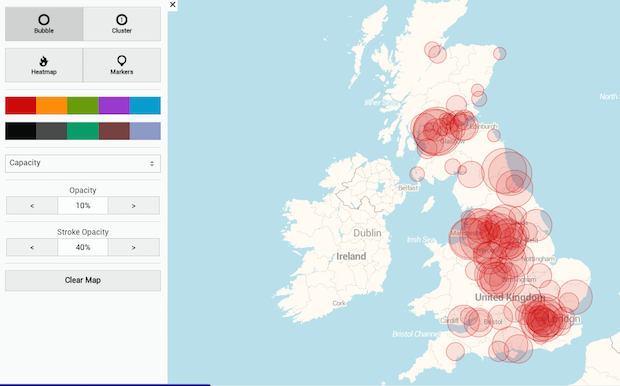 Here I’ve set the tool to show the size of bubble as the capacity of each of the stadiums. Mapsdata also provided several useful tools to convert data such as postcodes to longitudes and latitudes. Unfortunately, the Mapsdata service is no longer available (as at October 18). We’ll keep experimenting with different tools and will continue to share our experiences. 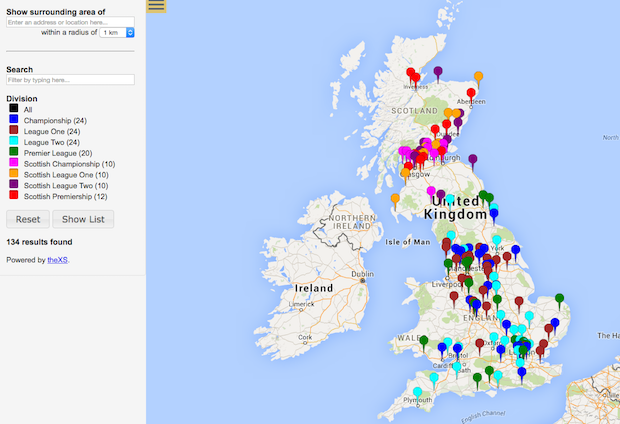 If you use any free tools for mapping postcodes we’d love to hear about it in the comments section. Ashraf Chohan is a senior performance analyst in GDS. Looks great, unfotunately, mapsdata.co.uk seems to not exist anymore. Any similar alternative? Has anyone used Online MapFinder? Not that I'm aware of at GDS and a search for Online MapFinder suggests you should be wary. The MapsData link hasn't been working for a year now! Isn't it time to change the blog?? We've updated the blog to note that, unfortunately, MapsData is no longer available. Hi. How do I get this to work for Australia? It is recognizing my postcodes as US codes? Really useful thanks, that's exactly what government should do! Thank you I bought this on your recommendation excellent. The Google Sheets Add-on looks really good, but I'm nervous about the T&Cs (below)... do you have any alternatives ? "Upload, download, update and delete files in your Google Drive Create, access, update and delete native Google documents in your Google Drive Manage files and documents in your Google Drive (e.g. search, organise and modify permissions and other metadata, such as title)"
"View, modify and share with other users spreadsheets that this application has been installed in"
I use another free tool called Geolytics (http://geo.sg), which is an awesome tool for creating heatmaps, bubble maps and cluster maps. It can also draw lines between points, so you can create a network to see how the suppliers and buyers are connected by shipments. Thanks for sharing this! Is it possible to upload a base map to the tool, e.g. 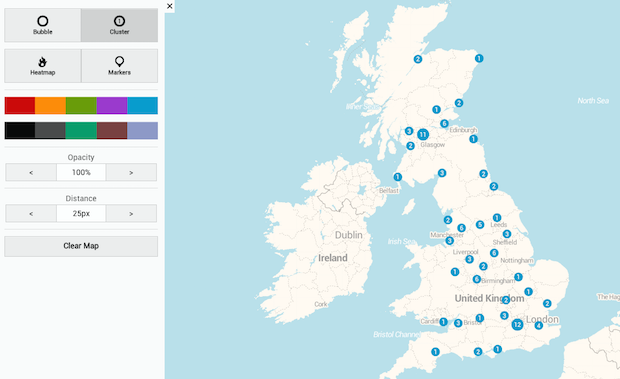 showing local authority boundaries, and then postcode data on top? We would like to see where certain data points fall in terms of LAs and regions. Thanks! Thank you for sharing the experience. I would love to try one in my country.